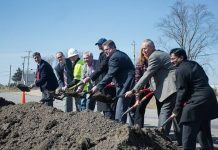 Earthwave Technologies, a provider of telematics solutions for heavy equipment contractors, has announced plans today to expand its operations in Indianapolis, creating up to 56 new jobs by 2022, the Indiana Economic Development Corp. (IEDC) says. The company, which provides wireless fleet management systems for construction contractors and heavy equipment owners, will invest $1.2 million to double its footprint at its current 8,000-sq. ft. headquarters, expanding into additional office space at 8727 Commerce Park Place in Indianapolis. Earthwave Technologies, which began construction in December, is currently updating its information technology infrastructure for its sales, development, delivery and support operations to accommodate the growth of its customer base. “Hoosier businesses continue to be at the forefront of creating 21st century solutions for companies around the world,” IEDC president Elaine Bedel said in a statement. “We are witnessing repeated stories of success from Indiana entrepreneurs that are taking advantage of our talented workforce and pro-growth business environment. We’re excited Earthwave continues to thrive here, and we’ll do our part to support their growth by ensuring that businesses of all sizes have the tools they need to succeed.